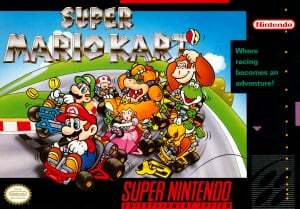 With a PAL release a mere nine months after the April 1992 launch of the UK SNES, during a 16-bit era where show-boating superior technology and exceptional console power was at the forefront of Nintendo’s objectives, Super Mario Kart remained humble in exhibiting its technical prowess. European gamers had been reminded by a Nintendo advertisement that patiently anticipating the SNES, plus ignoring the temptation of a SEGA Mega Drive, would be “worth its wait in gold. (And 32,767 other colours)”. Not only did it look terrific, but this original racer utilised the system's capabilities to provide smooth, exciting split-screen multiplayer to capture the imagination. The evolution of the racing game genre was a power hungry process, as arcade titles led the way, but even the hardiest consoles struggled at converting a convincing scrolling road — it was a luxury at the time. OutRun’s spectacular Super Scaler highways were adequately represented on the Mega Drive, and the PC Engine was tolerable at reproducing Chase H.Q., but they appeared unsophisticated when directly compared to the coin-ops. Shortly before the Super FX chip enabled Star Fox / Starwing to soar, polygon racers like Race Drivin’ chugged on unassisted SNES hardware. Nintendo answered this problem with Mode 7, and its SNES effects dazzled by rotating the single-player roads in F-Zero. Likewise, the cartridge inclusion of the DSP (digital signal processor) chip as an extra maths co-processor helped differentiate Pilotwings as a unique launch title when compared to games on rival systems. The modest 4 megabit cartridge for Super Mario Kart, which amounts to a mere half a megabyte, understated the split-screen wizardry of the time. The DSP chip was instrumental in ensuring two-player competitive racing, and it was the multiplayer that received the highest praise from the magazines of the day. For example, the first issue of Super Play in the UK awarded it 93% in November 1992, and the DSP chip was applauded for its hardware assistance in the same magazine. 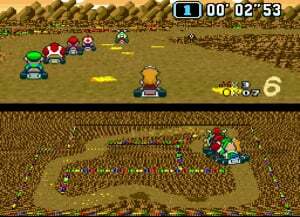 Although split-screen necessitated that half the display real estate became lost in single-player, Nintendo compensated for this by providing either a rear view mirror on the lower half of the screen, or a course map that highlighted the placement of other racers. 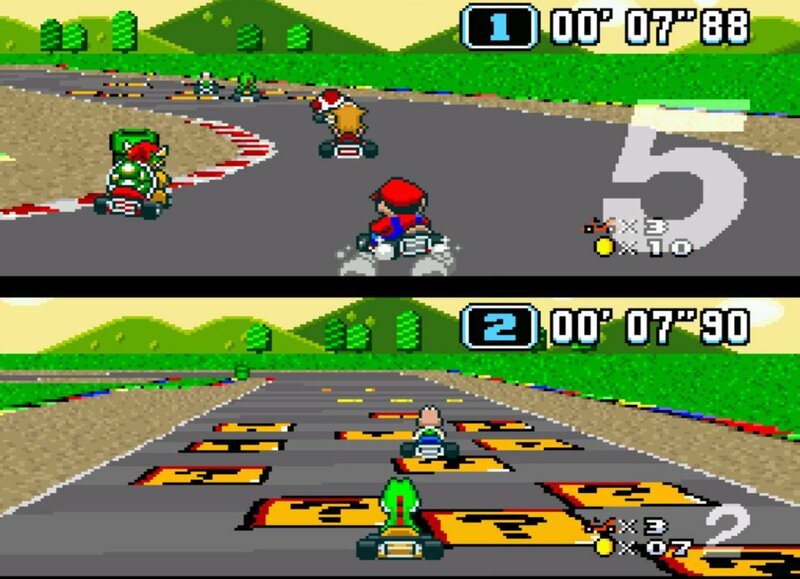 This means that a full-screen picture, without borders, is another reason to be appreciative of Nintendo releasing the 60Hz US version of Super Mario Kart on the European Wii U Virtual Console. 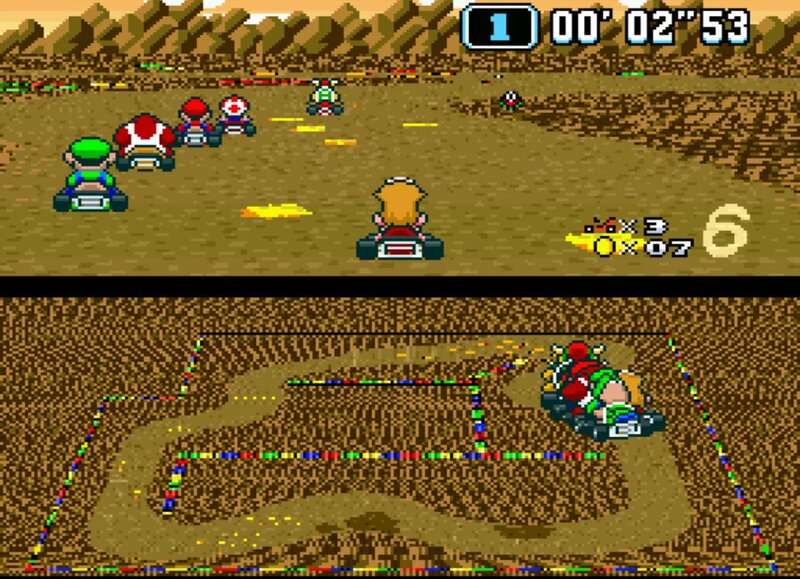 Even when later SNES Mode 7 titles like Street Racer added four-player, and a full screen for lonesome racers, the presentation of the roads in Super Mario Kart were smoother, plus its tracks stretched out at a clearer visible viewing angle. As the first game in the Mario Kart series, it was an inspired decision to place the inhabitants of the Mushroom Kingdom in go-karts, because the low-slung and lively vehicles expressed a youthful sprightliness. It achieved a similar sense of fun as Rare managed using radio-controlled cars in R.C. Pro-Am on NES, or SEGA displayed with bobble headed road hogs hurtling around rollercoaster tracks in arcade Power Drift. Hideki Konno is well regarded as a long-standing producer on the Mario Kart series, but his role as a director on Super Mario Kart, alongside Tadashi Sugiyama, is of added interest because Konno’s previous work was as map director for Super Mario World. Therefore, it was visually striking in 1992 how effectively Super Mario Kart presented the world of the SNES classic as race courses, which take a picturesque tour around Dinosaur Land. It feels like a snapshot of early 1990s Nintendo background design, from Monty Mole latching onto your kart in Donut Plains, to Boos loitering around Ghost Valley, or Cheep Cheeps diving out of Koopa Beach’s cyan blue waters. For this reason, locations like Choco Island feel unique today. Plus, unsurprisingly considering Sugiyama’s previous role as director of SNES Pilotwings, the tracks scroll, scale and rotate beautifully in Mode 7. It’s not only the visual design that provides sweet pangs of nostalgia, but from the opening Nintendo logo chime, to a truly memorable title screen theme, the creative input of sound composers Soya Oka and Taro Bando demonstrate exquisite chiptune work. Yet again, the eerily inviting haunted house motif of Ghost Valley, and the foreboding music of King Koopa’s lair in Bowser Castle, link directly back to the sounds of Super Mario World. Super Mario Kart parades a sense of pedigree in its development team, because Oka’s breezy compositions had already been enjoyed in Pilotwings, and Bando would later showcase his upbeat and catchy sound composer skills further in the same role on Stunt Race FX. It’s apparent that the joy of discovering the Mount Must Dash stage in Super Mario 3D World was conveyed as convincingly by the jaunty restyling of the Mario Circuit music as in the layout of the level. With a GP structure of twenty tracks, spread over four cups, the initial standout to a modern Mario Kart player first experiencing the original on Wii U is not only that Super Mario Kart has shorter courses with five laps each, but that you must also master five tracks per cup. Every corner in the design is carefully thought-out, so memorising the position of obstacles from pipes, to oil spills, as well as deep water, lava and ice blocks is important. The controls are as tight as the track design, but they demand that you learn how the inputs relate to a flat Mode 7 road, as opposed to looser, more forgiving controls in later games. It’s essential to master the timing of a shoulder button hop and understand how it sets the kart into a skid, for cutting a smooth tarmac hairpin without being hindered by speed decelerating grit or rough surfaces. Bouncing the kart is a versatile move, because if timed correctly it can take the sting out of losing momentum from bumping into an opponent, wall or obstacle. However, a clean run is required, as colliding with other racers, or drifting for too long, can spin out your kart. This places a risk and reward dynamic upon aiming for the hard to reach placement of speed boost arrows, or imaginative shortcuts, which could potentially help or hinder a flawless racing line. Coins are cleverly littered around tracks, and they’re essential as they make your kart less vulnerable, plus collecting ten coins increases your overall speed; zero coins means you spin out after a hit. The audio is an indicator of your performance, so an experienced Super Mario Kart player will listen to the rev sounds of the engine to assist with propelling forward with a rocket start, and as an indicator that you’ve reached the sweet spot of your kart’s top speed. Similarly, different road surfaces have a variety of sound effects. This is also the reason that gamers like Sami Cetin continue to be compelled to push themselves towards achieving record track times, almost 22 years after its release. Once you dedicate sessions to becoming proficient at a perfect single-player track Time Trial on each of your favourite courses, you’ll be thankful for the sturdy controls and the Off-TV play on the Wii U GamePad, because the urge to beat your record time is compulsive. Previously your Ghost image was lost when you ended a session, or reset your SNES, but the ability to repeatedly race against your best ghost using the ‘Create Restore Point’ is an advantageous perk of the Wii U version. The eight choices of characters are divided into four main skill sets, based upon three sets of heftiness. Donkey Kong Jr and Bowser are heavyweights with the slowest acceleration, but the highest top speed. Mario and Luigi are middleweights with standard performance, just as Yoshi and Princess are a medium weight, but with a lower top speed and faster acceleration. Finally, Toad and Koopa Troopa are the lightest, but have the most accessible handling, with solid, reliable controls. With a more rigid challenge, Super Mario Kart is arguably not as forgiving as later games in the series, so it’s potentially less approachable. However, without rubber banding, or a blue spiny shell, it could also be deemed fairer. On the one hand it’s possible to lap a friend or an AI competitor, but this is less likely as the difficulty ramps up after unlocking the 150cc engine class and the Special Cup, where the AI speedsters become increasingly aggressive. Each racer has a direct rival, for example the AI controlled Donkey Kong Jr shoots banana skins to repeatedly place top of the leaderboard against Mario, and Princess hounds Toad with shrinking mushrooms. Nonetheless, the cheap implementation of the AI rivals, who spam attack their character specific abilities and barge you off the side of the track, is a bugbear in the original game. The race leaders sit in a tight pack in the 150cc class, so one mistake can send a pacesetter to instant fifth place, and the loss of an extra life option to continue. Yet, a crafty player will learn the unflinching racing line of AI opponents, and drop bananas or green shells in their pathway. Later track designs become longer, and offer a more complicated variety of routes, such as dodging Thwomps in Bowser Castle 3. Also, a number of courses have no walls or boundary edges, like the unnerving and ruthless Rainbow Road. Super Mario Kart also includes some of the most ingenious shortcuts in the karting franchise, with an honourable mention given to the only series inclusion of the feather jump power-up, which enables the player to leap across gaps and bound over colourful block walls. A gamer experienced with the original title will demonstrate increasingly inventive approaches to a shortcut, beyond the more obvious use of a feather across a Ghost Valley gap. Instead they may use a mushroom speed-up to hurtle from a jump to a walkway on Ghost Valley 1, or combine a speed boost arrow with a feather across a lava gap in Bowser Castle 1, to exploit a detour that was possibly never intended as a short cut by the developers. Riding across non-renewable question mark tiles on the track’s surface grants the player items and weapons that have become standardised in the series, but were balanced and versatile when compared to early 1990s retro racers, like RoadBlasters on NES. Many items have multiple implementations, for example a banana can be either dropped behind, or flung in front of your kart. The timing and placement of an attack becomes crucial; for instance a devious player may watch the lower map screen to shrink the racing pack with a lightning bolt, ensuring that competitors no longer complete the jump in Mario Circuit 2. The incorporation of four competitive two-player battle courses — which are entertaining through simple, effective layout design — establishes Battle Mode as an ideal arena to demonstrate your kart handling skills and balloon popping mastery of the weaponry. Combined with the GP competition, this is excellent today and also helped Super Mario Kart to have a lasting buzz in the memory of gamers as one of the most satisfying multiplayer titles in the '90s on SNES, alongside Super Bomberman. Super Mario Kart has certainly been well tested in terms of replay value over 22 years. The balance of its items, as well as the tight design of its tracks and controls, etched-out the template for future games in the series. It's the type of game that’s worth purchasing again on Wii U, if only for the convenience of returning to its eternal fun, even when you already own it on other systems. 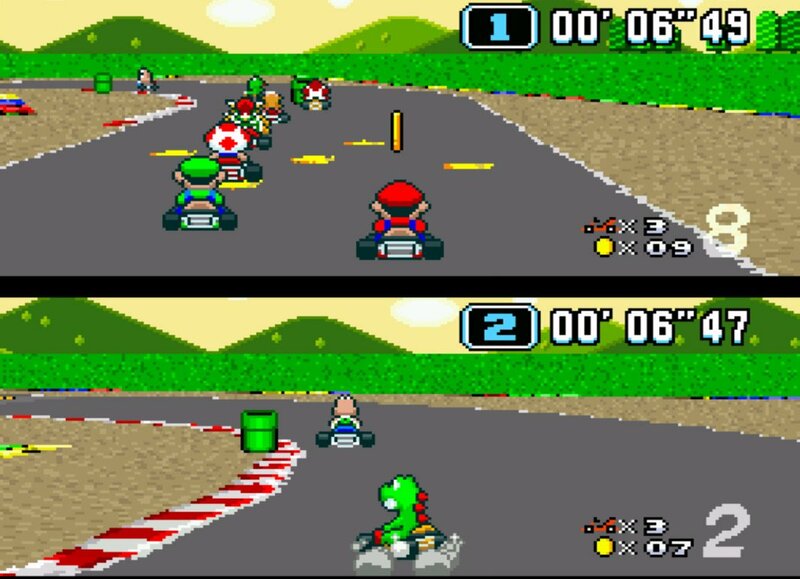 A combination of Mode 7 and the DSP chip were instrumental in ensuring that Super Mario Kart’s engine purred with smoothly rotating and scaling split-screen tracks. As the first game in the series, the inspired use of low-slung go-karts gave the gameplay a sprightly sense of exuberance. The finest SNES developer talent created visuals and sound compositions, which hark back to the Dinosaur Land setting, and are preserved in history like a 1992 Polaroid of 16-bit era Nintendo. With controls, track design and item balance meticulously structured, the mechanics over twenty tracks and four cups sketched-out the foundations of the franchise. Alongside a stern 150cc class and Special Cup challenge, boisterously cheap AI rivals can’t dampen the urge to rocket start, hop and power slide your way to a smooth tarmac, perfect lap run. Eight characters with handling based upon weight add replay value for approaching Time Trials, or two-player GP and Battle Mode showdowns. 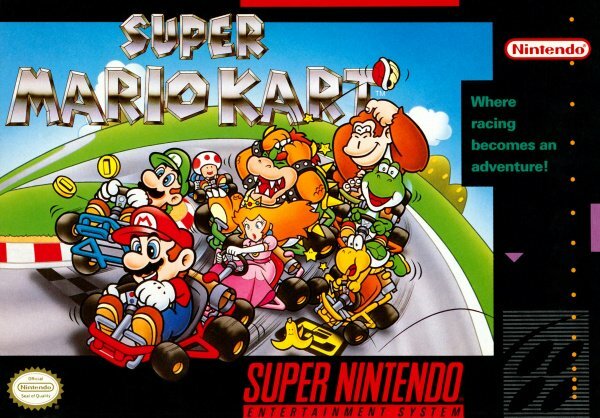 Super Mario Kart propelled the series forward from the starting line as a pacesetter, not only amongst karting games, but as a leader of the pack in the retro racing genre. Have this downloaded on the Wii, so no need for a double-dip on the Wii U. Such a classic, though. It's funny - this is the only game in the series where I've actually enjoyed the Battle Mode. In my top 5 games of all time. Still plays superbly to this day. @BigBluePanda I disagree, respectfully. It hasn't held up through the years as well as many others believe it has. I know I'm in the minority though. I still can't decide if I'm gonna get this and go digital on MK8 for the discount or pass on this and go with my LE MK8 pre-order along with the bonus key ring. To put it simply, SNES Super Mario Kart is one of my favourite games of all time. I agree with @BigBluePanda, it has a definite spot in my top five games list, and it’s a prime contender for the number one slot. My friends and I played it huge amounts during its first release, starting with when I imported the NTSC US cartridge during Christmas 1992, which means over the last 22 years it may be the game that I have put the greatest amount of hours into. The friendly competition was superb, not just in two-player GP races, but also Battle Mode and with rivalry over our fastest track times. I remember when I was studying during the summer of 1993, I borrowed my American SNES to my best friend, and he wiped the floor with my Time Trial records for Mario Circuit 1 and Ghost Valley 1. His times were awesome for the day, I wish I could see them again, but sadly my US cartridge has gone astray. I still own my Super Famicom version, which I bought much later on, because I like the colourful red and yellow Japanese manual/ box art. As far as I’m concerned, replaying Super Mario Kart on Wii U epitomises how the gameplay in a retro video game can remain relevant, and age gracefully over time. There's no feeling like holding a SNES controller and owning in Super Mario Kart. The GBA era tried to recreate the magic with Super Circuit, but the original just can't be touched. It's in my top ten of all-time. Beautiful review. Too bad NA can't have it yet. Even back when this came out, I found the racing somewhat dull. But the battle mode is awesome! I've always liked Super Mario Kart more than 64 and Double Dash but after MK DS I've loved all following releases more than the previous and it is looking like Mario Kart 8 will be the series Mangum Opus! I can not wait. Still have this on my snes, one of the best games ever. Havnt liked any of the sequels as much but I'm hoping MK8 changes that. OK, place your bets! When's the soonest this is coming to North America? I'm betting June at the earliest. And once again NoA is slow on the draw. Good lord this is getting annoying. As a non-native English speaker I find your reviews very difficult to read. Even if I know all the words and after reading them several times I still don't understand some of your sentences. I found the GamePad to be great for Time Trial mode, because I was able to settle down with Off-TV Play Super Mario Kart, and still keep the telly free, so my girlfriend could watch The Great Gatsby on Blu-ray. Also, the option of reloading my Ghost using the ‘Create Restore Point’ on Wii U was useful for following my best route around the track, so I could return to beat my times, even if my top initial Donkey Kong Jr meander of 1’03”77 on Mario Circuit 1 is not going to break any records (my first play’s best Mario Circuit 1 lap was 0’12”56). Like @NImH mentioned, the SNES pad felt very natural for Super Mario Kart, because it was so comfortable towards building a flow in a race, especially when using the shoulder buttons to bounce around corners. However, I was completely happy hopping into and out-of a power slide using the bulkier Wii U GamePad. I played an abundance of two-player GP and Battle Mode against my girlfriend for this review too, and the Wii U Pro Controller felt nice, as an alternative for gamers who find the GamePad a bit chunky. You can even control your kart with the analogue stick, but the D-pad is far more accurate in this game. This game. THIS GAME! Ohhh this game. Double rainbow. I'm with you on this one. I couldn't go back to it after MK64, and even now, I can't play MK64 because that too has aged terribly. To be honest, anything that uses "Mode 7" scaling like Star Fox, F-Zero, Pilotwings, etc is unplayable for me now. The platformers that use it are fine, but games that use it for driving or flying are awful and sometimes headache inducing. @UnseatingKDawg I would love to see it arrive alongside MK8. Good to see @JamieO reviewing on Nintendo Life again! I have the original cart for this, so no need to download it, but it's a 9/10 game indeed. I never really liked this game back in the day, but then I may have been too young and I only played it after I already knew MK64. And that is more than 15 years ago. So, I may in fact be interested in giving it another try, if it ever comes at a discount (different from the MK8 offer, as I'm not interested in downloading the latter anyway). 64 was the pinnacle for me. Oh man, the memories!! Me and friends played that Battle Mode to death, and loved every minute of it. Anytime I come back to this game, I'm always pleasantly reminded that this game didn't have the dreaded and unfair Blue Shell of Death. @antonvaltaz Thank you for that, what a completely sound thing to say! Mario Kart DS: Mario Circuit 1, Donut Plains 1, Koopa Beach 2 and Choco Island 2. 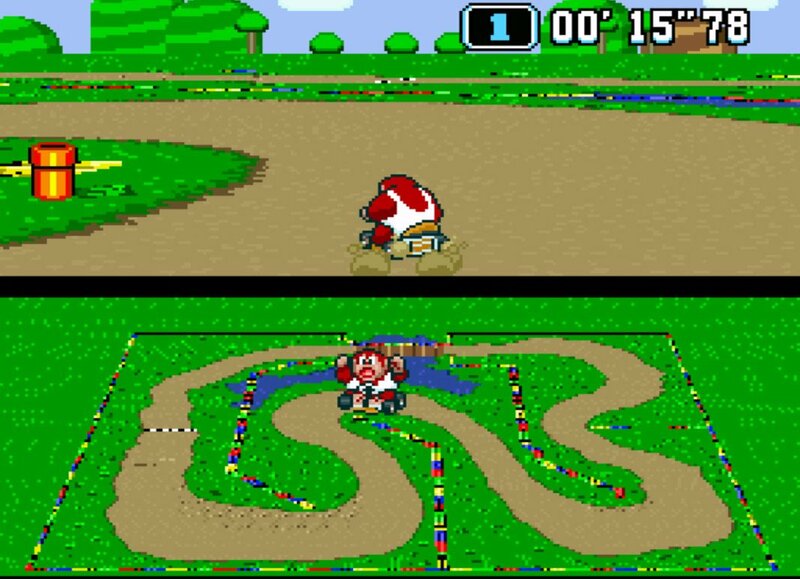 Mario Kart Wii: Ghost Valley 2 and Mario Circuit 3, but also Battle Course 4 from the SNES game’s Battle Mode. Mario Kart 7: Mario Circuit 2 and Rainbow Road. The GameBoy Advance game Mario Kart: Super Circuit had extra cups that could be unlocked, which included all twenty of the SNES tracks as a bonus. The only trouble is that many of these courses don’t feel as satisfying in games that didn’t have the feather item to take advantage of their clever shortcuts. The SNES tracks are also shorter, so their flow can feel unusual in the context of later games, and sometimes the placement of speed boost arrows has been altered or removed. In some videos for Mario Kart 8 there is also a track that resembles Mario Circuit, but it has been flipped around and broken into segments to allow for the new game’s anti-gravity mechanics. It’s not necessarily from a SNES version of Mario Circuit, but it looks purely ace to me. I still think this game holds up although mode 7 on a massive screen doesn't look as good as on the gamepad. I prefer the tighter handling of each subsequent entry in the series but this one is still fun and battle mode on this game was probably my favourite except maybe 64. I've read lots of people say that this was the pinnacle of the series because it had no Blue Shells or 'rubber band AI'. This game has the most cheaty AI of any entry in the series by a million miles. I really don't understand how people can claim that the problem has got worse in the series. When will they bring this to the US WiiU eshop so I can convert my Wii VC game finally?! F-Zero is still the best SNES racer of all time and in my book the best 16-bit racer from that era period. I love the MK series but this one hasn't held up as well for me. I still like it but it's the weakest one in the series by far. This is also one of the best kart racers ever made too!! Anyone else remember playing this? I still play it often! @YoshiTails Yes, two-player works with Wii U Super Mario Kart. 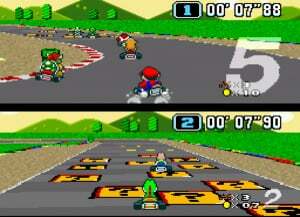 Two people can race in a GP against six CPU controlled characters, or in a one-on-one Match Race. There is also a two-player Battle Mode, where you use items like red or green shells, and an invincibility star to burst three balloons, which rotate around your friend’s kart. Battle Mode is the only part of the SNES game where you can collect a ghost item, to steal your friend’s weapons. I played two-player with my girlfriend using the Wii U GamePad as player one, and a Wii U Pro Controller as player two. I had to set up a Wii Remote as my first controller, even though I wasn't using it, because this is the easiest way for the Wii U to recognise the Wii U Pro Controller as player two. It’s also possible to use a Classic Controller Pro, but I did not test this. The eShop lists the Wii Remote as an optional controller, where it lists the Wii Remote and Classic Controller Pro together. Presumably you have to plug your Classic Controller Pro into your Wii Remote. The GamePad, Wii U Pro Controller and Classic Controller Pro all have a button layout and shoulder buttons that are relatively similar to a SNES pad, in comparison to a Wii Remote, at least. I hope that helps! For me this and the GBA version are the Mario Karts ive had the most fun with, i always equated the difference back in the day between the PAL 50hz and NTSC 60hz being that the PAL 50hz on 150cc run at the same speed (or feeling anyway) as the NTSC 60hz 100cc. @XyVoX The GBA MK is excellent!!! One of the best in the series! The Super Nintendo/Super Famicom "Club Nintendo" controllers are the BEST way to play these games on Wii U. I imported 2 from Japan. I believe Europe got them as well. They're little pricey but totally worth it. They're the exact same controllers with a Wii connector at the end. HIGHLY recommended!! @Dreamcaster-X Good point, I really should try and get hold of a classic Super Famicom controller for using on my Wii U. I bought a Hori pad that was a similar shape, but with the GameCube's layout of buttons, many years ago. I used it on my GameCube for retro compilations, but it wasn't ideal. @JamieO and everyone, you may have seen already, an article has just gone up regarding the Super Mario Kart (SNES) World Championship 2014. A huge yearly event, something you would definitely enjoy being a part of If you have any questions feel free to ask me there. Come on!!!! Update this with online. No bells or whistles.... Just 8 Player online of original Mario Kart!!! I'd pay £25 for that!!!! Come on Ninty..... Bit of fan service please!!!!! PS ... "Without rubber banding" ...... This is the ultimate game for rubber banding. My brother always loved this game, but I hated it...I never could get a handle on the controls. I actually didn't like the GBA game for the very same reason. Maybe I haven't played them enough, but the later Mario Karts (Wii, and 7) are more up my alley. I initially had the same problem with F-zero Maximum Velocity, but I got used to the controls, and it's now my favorite racing game. Maybe the same could happen with MK on SNES and GBA. It just seems like the controls on those two MK games slide all over the place. @fluggy It would need to be rebuilt from scratch probably, i heard some years ago that someone out there was testing something out with a rom but it never came to be in the end. Nothing beats the original handling though. Sure they could do it as a DLC update. Just a tweak here n there. Same graphics n game... Just balance out the characters abilities. Hey there, great review. Unfortunately I can't set up the 2 player game. I have to play it with the wii u gamepad and a remote. When I start the game there's always a pop-up saying it cannot be controlled with a remote and all remotes will be deactivated. Any advices? The feature that @SamiCetinSMK has mentioned here is excellent, it's called A Look At the Super Mario Kart (SNES) World Championship 2014 and it recently went live. I definitely recommend that Super Mario Kart fans check it out, because it has some brilliant videos of skilled players, a cool Mario against Bowser ‘Battle Mode’ image for the poster, and lots of details about the event. Great stuff! @TimCredible Apologies, I never even tried to test Super Mario Kart with a Wii Remote for this review, I played with a GamePad and Wii U Pro Controller. I based my answer to the question above on the eShop’s description page for Super Mario Kart, where it lists the Wii Remote as an optional controller. However, I think that this list must refer more to a general criterion for Wii U Virtual Console games, although I noted it down from the Super Mario Kart eShop section. I just tried to play with the Wii Remote and I got the same message of "This game cannot be played with a Wii Remote", which makes sense under the circumstances due to a lack of shoulder buttons. Sorry about that, I'll add an edit to my comment above to avoid confusion. @TimCredible Ha ha, well done for discovering this, I just booted Super Mario Kart while holding button 2 down on my Wii Remote, and it brings up the message "As there are not enough buttons, you may have to change the button links in Controller Setttings". The default Wii Remote controls are for button 1 to accelerate and button 2 to select and fire weapons/ items. You can then go to Controller Settings, and set up the B button to hop. You just need to set the B button up to take the place of an L or R shoulder button. It's not ideal, but you can hop and drift using the Wii Remote in Wii U Super Mario Kart. The D-pad is small, but functional, plus the acceleration and items buttons work just fine. Thanks again! It never actually occurred to me to play SNES Super Mario Kart using a Wii Remote before. It means that gamers who don't have a spare Wii U Pro Controller or Classic Controller Pro can still play a two-player game. Just make sure the most skilled player has the disadvantage of hopping using the B button on the Wii Remote. The more the merrier! I know we all here are huge Nintendo fans, but I got to say that I am really amazed of how everybody is so enthusiastic and passionate about this game. This is truly what makes Nintendo so special. Super Mario Kart was released more than 20 years ago, and still we're all very excited to play this game on the Wii U. Got to say... Nintendo is awesome. @Nintenjoe64 If I were N I'd make the tracks from the original, 64, DD, and Super Circuit available as DLC. I'd have to think about the others simply because they can be played on the current hardware. I love this game so much !!! @JamieO That was a brilliant review. Perfect example of how to review a retro game positioning it in the context of the time with some interesting facts. MK is one of the defining games of my childhood. I was supposed to be comment no.4 I have commented late. Super Mario Kart is the best entry in the series. Thank you for the review, it was more thorough and comprehensive. I cannot play the 2D Mario Kart games. The driving/manuvering perspective is so awkward if you grew up playing on MK64, Double Dash, and beyond. @Nintenjoe64 and @fluggy My understanding of the term ‘rubber banding’ is of an invisible rubber band between the leaders in a racing game, and those who are struggling at the back. When a rubber band system is in place, the AI players actually become faster when you are in front. Yet, you can lap CPU characters repeatedly in Super Mario Kart, so in my eyes it does not have a rubber band difficulty balancing system. I agree that the AI racers in Super Mario Kart are frustratingly aggressive, especially in 150cc Special Cup. In a single-player GP, all seven CPU opponents will deliberately try to knock you off the bridge in Donut Plains 3, or bump you off the sides of Ghost Valley 3 and Rainbow Road. I also agree that the AI characters are cheap too, as they have special individual abilities with unlimited effect that the player does not have access to, like Bowser’s fireball and Yoshi’s eggs. Yet, if you speed boost past the CPU at the start line, you can have a perfect run, and lap the AI racers, even in 150cc. You can also learn their set route and aim attacks at them from the front of the pack. For example, if you know exactly where to leave a banana before the speed jump in Mario Circuit 2, from first position you can send the second place CPU AI to the back of the pack, because they won’t make the jump. @placidcasual and @James1993 Cheers for your kind comments. Oh, man... yeah the battle mode was great in this one. But I gotta admit, I think Mario Kart 64 was my all time favorite. I just loved the stages so much. It had that Double Decker map, and the other one with multiple stories... I loved that about them. Added a lot of strategy and fun to the battle. I used to play that so much- I must've spent a solid year of my life just playing Mario Kart 64 Battle Mode! All Mario kart games are great fun but my favourite by far was double dash although I know I am in the minority here. I have great memories of playing super mario kart the battle multiplayer was awesome. To EVERYONE, bring it the day Super Mario Kart becomes playable online. Best Super Mario Kart is the PAL version running at 60hz. (Never realised it was optimised at the time as soon as I could do 60hz I did using the PAL cartridge). I’m a fan of retro gaming magazines, as much as I love the actual classic games, so I studied lots of old magazines from my collection to prepare for this review. I’ve already mentioned Super Play, and I flicked through the first five issues of that gem, but I also read reviews in Nintendo Magazine System, as well as Computer and Video Games (CVG). The interesting thing about CVG was that I read their review first, and they were clearly impressed as they scored it 96/100. The Super Mario Kart review was in CVG Issue 133, from December 1992, and it had a stunning piece of Super Star Wars X-wing artwork on its cover. However, I was reading a much later CVG, Issue 211 from June 1999, just because that’s what I do for fun, and I found a Mario Kart reference that highlighted the impact of this series, all those years ago. There was a review of PSone Bomberman Fantasy Race, which scored a paltry 1/5, and Ed Lomas opened it by stating that “Thanks to Super Mario Kart, overused game licenses always have the option of coming back as cartoony racers”. It struck me that the legacy of Super Mario Kart was not just that it laid the groundwork for quality game mechanics in its own series, but it created a sub-genre that other developers wanted to mimic. The trouble was that the idea of simply sticking a few reasonably well liked third-party characters into a go-kart was never enough. Nintendo created a kingdom as a setting, and mascots that were some of the most famous icons in the industry. However, the gameplay was still tight, well crafted, and you could rely on it to be fun. I guess that many developers have been taught over time that it’s not as easy as it seems to churn out a kart racer. @JamieO There is a Konami Kart racer that was pretty good or the Rare ones. The best I ever I think is the PC version of All Stars Racing Transformed (Fixes everything I find wrong with Mario Kart - They should have done the console versions better the mobile versions are 60fps). Super Play was perfect for me. The reviews seemed to be more like a consensus. (Only thing I didn't agree with is when they downgraded Mario World to 80%) and the balance between import and normal reviews was great as well. Good review. Think Virtua Racing was quite impressive with its custom chip. (Only a year later). @JamieO Not only do other dev mimic Nintendo in terms of making a better Mario Kart clone but ever since Super Smash Bros. became popular, fighting games of that genre also started appearing using the same idea. I'm not saying Nintendo is the first to make that kind of game though I'm saying that because Nintendo makes that kind of game and it work for them, others will try to mimic that and make it better. @unrandomsam You’re right, Super Play did not shy away from changing scores, even Super Mario Kart’s score was upgraded from Issue 1 where it scored 93%, to the PAL review in Issue 4 where it received 94%. They included different scores for each reviewer too at first, a bit like how US magazines like Electronic Gaming Monthly would have four separate scores, one for each reviewer. Their import coverage and presentation style was excellent. There have been lots of great kart racers, just like you mentioned. I’m a fan of Naughty Dog’s Crash Team Racing on PSone, and you’re spot on about Sonic & All-Stars Racing Transformed, I think that Sumo Digital’s title was successful at including a sense of SEGA’s flamboyant arcade history to spice up that game. I only played it on Wii U and PS Vita, so I’d be interested in seeing the improvements on a PC. @retro_player_22 That’s a good comparison, because it’s unwise of a developer to presume that Super Smash Bros. as a series is a straightforward formula to recreate, because its gameplay balance is far more complicated than it may appear. You can’t just make a colourful party fighter with lots of characters and expect a recipe of success. I guess imitation is the sincerest form of flattery, though. @SparkOfSpirit Thank you, and I hope you guys receive the Wii U version of Super Mario Kart soon. I got this through a Club Nintendo reward a few months ago...and I remembered that I never really liked this game too much and it has aged quite poorly. For some genres, the jump to full 3d immersive environments hasn't done much for the overall quality of the games. RPGs and Platformers of the 16 bit era hold up very well, while racing games and shooters...not so much. Still, it's a fun game with another player and a few beers for nostalgia sake...I'm much more excited for MK8! I never was a big fan of the original game... my infatuation with the series started with Mario Kart 64. Downloaded this last night can't get enough! The thing I don't like about this game is the coin collecting and the half screen in single player.. Although, I still prefer F-Zero's faster and purer skill based racing experience. Both truly great racing games on SNES that still hold up to this day. Been playing this for the last few days and I still just can't get a grip on this game. The controls are just too slippery for me to handle when I'm so used to later entries in the series. The AI is also horribly cheap sometimes. I play as Yoshi and always have Koopa, DK Jr and Peach in 2nd, 3rd and 4th unless I knock one back. It's only through the Wii U's save states that I unlocked the 100cc Special Cup and it's so brutal to me! Hoping Mario Kart 64 makes it sometime soon, as that is where I fell in love with Mario Kart, and remains my favourite version to this day! @Kirk Talking about F-Zero Damm did Sega do an amazing job modifying the SMB2 engine for F-Zero on the Gamecube that game was amazing, i'd love Sega to do another F-Zero thats for sure. Revolutionairy game, i would give it a 10.
just one question: why are the walls flat? @xj0462 It is a 2D game, but because of the clever invention of Mode 7 graphics it gives the look of a 3D racer when you are driving. Very clever as it has tricked us into asking why the walls are flat, and things like that. The kart only pivots on the spot or moves up with jumps / items. Actually, other than the graphics looking pretty, I didn't enjoy the Sega game as much as either the SNES original or the N64 version. The graphics were obviously very nice but the tracks were much harder to read at times because of a combination of too much going on visually and some dodgy track design in places, with kind of blind corners and stuff, to the point that I actually felt it wasn't as satisfying to play the game as the previous versions. Mind you; if they could make sure the graphics didn't actually get in the way this time and doubly made sure that all the tracks were very readable then I wouldn't mind another F-Zero game from Sega. Ultimately though, I'd just like a proper new full-on F-Zero game that was as good as it could possibly be. @remivir You mean black borders on left and right? That's because you probably have 16:9 widescreen TV. This game's aspect ratio is 4:3, therefore the image is not stretched. Choose 16:9 from your TV's settings, if you want the image strecthed. @remivir The picture is full screen in the European release of the 60Hz US Super Mario Kart on Wii U, which is most evident from the title screen, although the main gameplay area still has small borders during gameplay. 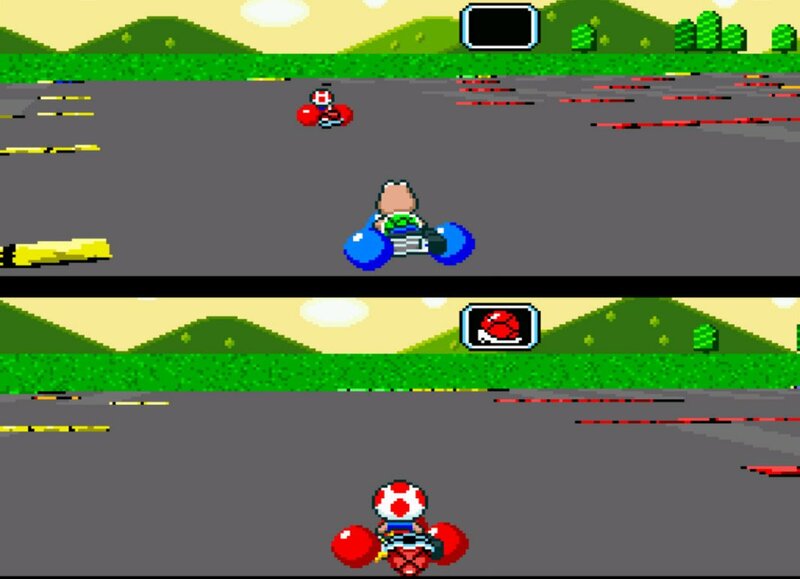 Check that the Super Mario Kart title screen does not have any top or bottom borders, but don’t worry if there are slight borders during split-screen gameplay. This means that the characters do not appear as squished and chubby, as they did with the more squashed together top and bottom borders in the PAL version. As @Andyliini explained it runs in 4:3 ratio, as a retro game built in 1992 should, because the side borders are a result of modern 16:9 widescreen TV sets. If you change your TV settings to 16:9 widescreen you will stretch out the graphics and characters. Edit: Even if I change my TV aspect settings to 16:9, the game still runs as it is supposed to in 4:3 aspect ratio. I can use a zoom option on my TV to remove the side borders, but that is counterproductive, because the visuals in this game were drawn for a 4:3 display. I feel that it looks clear and vibrant in 1080p on my plasma TV. Considering it’s the US version on the European Wii U Virtual Console, it’s also running at 60Hz, although this isn’t quite as relevant as it was in many other PAL SNES games. In the 1990s we often talked about a speed difference based upon a magic figure of NTSC games running at 17.5% faster, but the 50Hz PAL release of Super Mario Kart had its clock and speed modified to bring it slightly closer to the NTSC version. My understanding is that the PAL version is still slower, but not as sluggish as PAL games that didn’t include alterations, although I have no idea of how close PAL Super Mario Kart ran in comparison to the NTSC version. I think that the clock on the PAL game may have been adjusted, so that sixty seconds in-game still translated to one minute, but I can’t confirm that. Over the past 22 years, I’ve only owned the US and Japanese Super Famicom cartridges of this game. However, my understanding is that gamers who chase track records on Super Mario Kart will understandably keep the Time Trial competitions separate between the PAL and NTSC versions. Please note, I’m not claiming to be an authority on this, I’m sure an expert like @SamiCetinSMK could explain the differences between PAL and NTSC Super Mario Kart more eloquently than I have. Still, it’s often preferable, and a welcome inclusion, to receive the US 60Hz and full-screen NTSC version of SNES games on the European Wii U Virtual Console. Good job, Nintendo. If anyone is interested in this topic, have a read of Talking Point: The Virtual Console's PAL Problem, which is a 2010 Nintendo Life feature that discusses these issues in regard to the Wii Virtual Console. It was a PAL problem that is repeatedly being rectified on the Wii U’s EU Virtual Console. I've had the US version since Christmas '92, played it on a PAL SNES for a couple of years then on my US SNES when I finally invested in one. Moving to the PAL version was horrific. Sure, they 'optimised' it so it was about as fast as the NTSC version, but they ruined most of the mechanics in the process. the hop landed quicker, the steering was fudged, and the tight looseness of the whole thing seemed off. Okay, they toughened the CPU up to provide a bit more of a challenge but also took most of their ability to screw up with it, leaving a much less FUN game in its place. Also : there is no rubber banding what-so-ever. Now, when I hear the term rubber banding, I think of it as the CPU against the human. Sure, knocking a CPU kart from second to last will result in that kart going extraordinarily fast to get back up to 2nd if that's where it is "meant to be" but they certainly don't rubber band up to and way past the human player, Which is good. The controls are the simplest yet most satisfying of any of the Karts I've played (all bar DS), the track designs are all nice and tight and none of them over-long, and the battle mode has yet to be beaten. Worst Mario Kart game...still pretty enjoyable. The PAL version was reprogrammed as it would have been way too slow with the 17% difference. They also adjusted the mechanics a little. However I have to say I don't like the turn angles on NTSC. It is more sluggish on some of the later tracks whereas the PAL one is better for fine tuning. Also NTSC has some extra shortcuts which are more extreme and easier to hit but also cut too much off the tracks. Donut Plains courses are an example. Getting round hairpins on MC4 and DP3 on NTSC 150cc are a nuisance, whereas you can do it on PAL. There is better dodging ability on PAL for red shells, however that can be both an advantage and disadvantage depending what you prefer. Longboosting is too aggressive to get round some corners with the shrooms on NTSC and worst of all, the mini turbo length on NTSC is too short in distance! PAL is longer and helps cut across the amount of dirt to you want to The boost starts are a nuisance on PAL but awful on NTSC, we done a few small NTSC tournaments in 2012 and it was frustrating experience for everyone, thankfully I didn't take part in the Time Trial section of that Theres lots more but il post that later as I remember it. @SamiCetinSMK Cheers for such a detailed response, I feel that I have a decent enough knowledge regarding the depths of Super Mario Kart, but your understanding of the complexities of this game goes to another level. Your description also provides another perspective to the age-old PAL vs. NTSC debate. For example, from the changes that you’ve indicated in the feel of the turn angles and longboosting, to the way in which you approach shortcuts, hairpins, or avoid red shells, you’ve verified that it’s not always clear cut to just compare speed issues or different border sizes. I guess over the years it has become tempting for retro gamers to overly simplify this topic with a ‘PAL is worst and NTSC is best’ attitude, I include myself in this at times, but it’s worth keeping our minds open that a PAL version can have added rewards, too. It’s fascinating to me that you have delved so deeply into the intricacies of the PAL game, so it feels a bit like Alice tumbling down the rabbit hole to learn of so many extra game mechanics, after I’ve been playing Super Mario Kart for more than two decades. Then again, perhaps I should say it feels like a moustachioed plumber driving his kart head first into Monty Mole’s underground burrow, under the circumstances. Thank you for sharing your expertise with us here. Nice one! Still the best game ever! @arizvega Hiya, do you have a SNES + SMK, would you be keen to join in some competition for either Time Trial / Multiplayer or both? I strongly disagree with the review score. The game seems to be overrated in my eyes, especially considering on how poorly aged it is. If you take off your nostalgia glasses for a moment, it'll be more unbearable than you might remember. The difficulty and struggle I've felt in this game are mostly attributed to the limited SNES capabilities during its heydays and the impressive-but-now-outdated Mode 7 technology. This is what caused the developers to make sure the AIs cheat very often starting at 100cc to offer (unfair) challenge and couldn't conceive bigger tracks. Were they excusable back then? Yeah. It was one of a kind racing game that revolutionized the genre.Time travel forward to today, and these technical shortcomings are inexcusable, simply because there are better racing games out there. Also, the kart physics are so awkward that it makes the player far more prone on getting out of the track and smashing on the walls, especially in 150cc. Powersliding and hopping sure helps you on going faster, but it actually swerves you more on the outside of a corner that you had to react inhumanly fast to properly reorient your kart. This mechanic is tough to master just because the tracks are too small! I just can't stand of the game's 100cc and 150cc difficulty, simply because they were resulted from the system's limitations. And that's coming from someone who plays quite well in Mario Kart 64, 7 and 8. Super Mario Kart is a classic, but definitely not a timeless one for sure! If I were to be a reviewer, I would give it a 6, or a 7 if I'm feeling generous. @JCnator The driving mechanics in this game are completely faultless. Go / stop, easy. Turn with just the d-pad, or hop and turn for a tighter turn, hop back out of a corner to straighten up. Easy. Mastering it does require patience and effort, of course, but attributing the fact you have to learn this is no way indicative of a game whose systems are limited by the hardware it runs on. The AI certainly doesn't cheat, in the sense that they won't zoom off in to the distance faster than you could ever hope to go as in Mario Kart 64. Sure, they're programmed to not make many / any errors but if you're good at the game, you will win - testament to the fairness of the game. As for bigger tracks, it's a kart game. You don't see real Kart racing taking place at Leguna Seca, or Silverstone do you? The small, perfectly formed tracks are designed for fun first of all, and once you MASTER THE CONTROLS, become excellent for slinging your kart around them as fast as is possible. In fact, if the driving mechanics weren't utterly sound, I doubt the Time Trialling community would be as big as it is. So yeah. In my opinion, your opinions are incorrect. But that's what discussion's for, right? @mandlecreed So, it turns out that the SMK driver's display was deceiving me about how perfect the controls actually are. In F-Zero, you could easily see anything that's far ahead of you due of the whole screen resolution allocated for the driver display. The same display from SMK is always split horizontally and feels a bit squashed. This makes obstacles difficult to anticipate and render the visuals less appealing, especially on the Choco Island tracks. For single-player modes, the always active split-screen function tend to bother me. I'd rather have a mini-map over the huge map sitting at the bottom screen like F-Zero does. Had this issue resolved, I'd get a better idea on how each driver handles. Or perhaps having more sprites that indicates which direction my character is facing could be helpful, too. The CPUs do cheat regarding on their item usage, whether or not they decide to jump over bananas and shells as well of passing through Thwomps like if it was nothing. If a player is directly in front or behind a CPU driver, the latter tends to throw/drop their special item against their foe. And they can do that as many times as they wish. Starting on 100cc, the CPUs will sometimes jump over items you placed on a track. I presume that 150cc is worse on that regard, because they pull these tricks much more often than the previous difficulty. The fact that the AI racers can pass through Thwomps while I can't gives them an advantage in the later Bowser Castle tracks and Rainbow Road.